The place where I work is located in Glenwood, which is situated between Eugene and Springfield (where the Simpsons live). Glenwood is an unincorporated area, meaning that it has no actual city government. It has a Eugene postal address, and it is patrolled by Springfield’s police. The main strip in Glenwood is Franklin Boulevard, a drab expanse of rental places, used car lots and pawn shops. I guess this is what happens when you have no government. I have seen other unincorporated areas in Oregon, and they all look pretty much the same. This is one of the reasons why I’ve never been able to buy the argument that government is inherently a bad thing. There are people living in Glenwood, though you might not guess this from driving down Franklin Boulevard. I have not been able to find any estimates of the population. I guess this is due to the place having no government. Glenwood has a reputation for being home to hippies, eccentrics and low income people. There are several trailer parks in the area. For a while I was without a car. 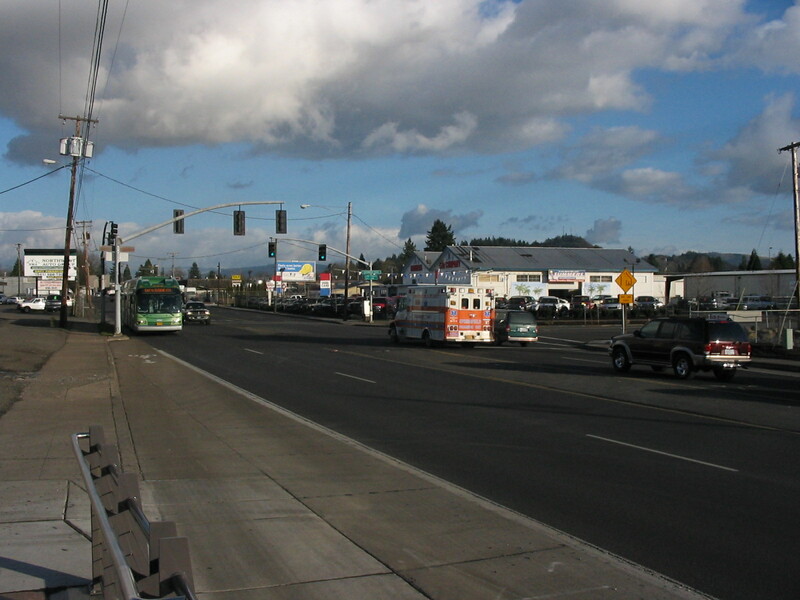 I would get to work using a Eugene bus that goes through Glenwood. I get out of work in the evenings after dark. One night it was pouring rain. I was wearing a poncho. I was walking down the street that takes me to a bus stop on Franklin Boulevard. I was coming up to the intersection with Franklin. There were railroad tracks on my left. On my right was a towing garage that looked as though it had gone out of business. On the other side of the intersection was a trailer park. A Springfield police car came along on Franklin, and it came to a sudden stop in the middle of the intersection. I could see a police officer looking in my direction. I looked behind me, but I could see nothing. The police car then drove a short way down the street, pulled into a parking lot and turned around. I began to think that this perhaps had something to do with me, but I told myself I was being paranoid, and I tried to put it out of my mind. I turned on to the sidewalk on Franklin and crossed underneath a railroad bridge. The cruiser pulled into a parking lot ahead of me. A police officer got out and walked towards me. He was quite tall. He wanted to know what I was doing. I told him I had just gotten out of work, and I was walking to the bus station. He smirked at me as though he didn’t really believe me. However, he got back in his cruiser and drove away. Although nothing came of this incident, it left me feeling disturbed. I have lived in Boston, New York, Jersey City and Los Angeles. This is the first time I have ever been stopped and questioned by a policeman just for walking down a street. When I told my friends about this, they said the cop probably thought I was looking to buy drugs from somebody. Apparently, Glenwood has that kind of reputation. Of course, there are a lot easier ways to get drugs in the Eugene area than by walking around Glenwood in the pouring rain, though I suppose the Springfield Police may not be aware of this. Since then, I’ve often wondered if people who live in Glenwood often get stopped and questioned by the Springfield Police. Since the people there have no say in Springfield’s government, this amounts to an occupation. One of the drawbacks to not having a government is that eventually you find yourself at the mercy of some foreign entity. Such as the Springfield police. This entry was posted on December 9, 2010 at 8:13 am and is filed under Eugene, Oregon, Police. You can follow any responses to this entry through the RSS 2.0 feed. You can leave a response, or trackback from your own site.